It has been over four decades since I anxiously turned the dial on my parents' black and white TV to watch the "Battle of the Sexes", the heavily-hyped, historic tennis match between Billie Jean King and Bobby Riggs. But the female vs. male match between Grand Slam winner King and self-proclaimed male-chauvinist Riggs reflected more than what simply took place on the court. "I was playing for all women," King said at the time, "and I knew that it would have set (women) back 50 years if I didn't win." Fortunately, she did, thereby furthering the cause of women's struggle for equality in the 1970s. It had such a huge impact on society, in fact, that in 1990 King was named one of the 100 Most Important Americans of the 20th Century by Life magazine. Fast forward to the 21st century, and King has no plans to retire, at least not off the court. Believing the need to level the playing field today is equally as crucial, King is now challenging the corporate world. "The amount of untapped human potential in our world is enormous, yet in so many places, challenges like gender, race and sexuality are used to discriminate against women and men and prevent them from reaching their full potential," King says. This couldn't be more true. While the gender wage gap four decades ago was 59 percent, women's earnings are still not equal to men's, at 78.3 percent in 2013, according to Census statistics released in September, 2014. And the pay gap is even worse for women of color (54 percent for Hispanic women and 64 percent for African-American women). But the struggles for equality do not just exist around gender. Currently, there is no U.S. federal law that adequately protects lesbian, gay, bisexual, and transgender (LGBT) workers from employment discrimination. Further, only 18 states and the District of Columbia have laws explicitly protecting LGBT workers from being fired because of their sexual orientation or gender identity, and no federal law adequately protects LGBT workers from being fired because of who they are or who they love. Additionally, more than four in 10 lesbian, gay, and bisexual people have experienced some form of employment discrimination based on their sexual orientation at some point in their lives, and 90 percent of transgender employees have experienced harassment, mistreatment or discrimination on the job. King is intent on changing this. She and her partner, Ilana Kloss, in partnership with Teneo Holdings, founded the Billie Jean King Leadership Initiative (BJKLI) in November, 2014, as part of an effort to challenge the way these differences are seen, and encourage companies, corporations and individuals to embrace those with diverse personalities and lifestyles for the positive and unique contributions they bring to the workforce. "We are aware that an increasing number of companies are launching diversity programs to provide more supportive working environments," King says, "But we want to make sure that these initiatives are actually translating into full inclusion. Essentially, we want to make sure these companies are 'walking the talk'." As such, the Initiative is primed with a mission to inspire future leaders, hoping to motivate people in positions of power to promote diverse identities and challenge the status quo. "With their help, we can reach the next generation, and together we will build a more inclusive, respectful society," King adds. Fortunately, a number of companies have already joined in the challenge. DeLoitte, for example, has formed a research collaboration with BJKLI to produce a body of research that explores creative ways in which organizations are leveraging the collective ideas, perspectives, and input of their inclusive talent to drive business and grow the bottom line. UBS Group Americas, Cadwalader, Wickersham & Taft LLP, and Teneo Holdings have also entrusted their support to King's organization. And it doesn't stop there. King has also enlisted the support of individuals who are no strangers to breaking through the status-quo, including Sir Elton John, Jason Collins, Robin Roberts, and Christiane Amanpour. "We must have equal pay for equal play," Amanpour asserts. "Further," King adds, "We need leaders, in both the public and private sectors, to look at differences in the workplace through a lens where individuals are embraced for their unique contributions rather than judged, discounted or alienated for what makes them different. But to believe you can be also a leader, it is important to see someone already in that position, someone who has already broken through barriers to set an example. Essentially, you have to see it to be it." 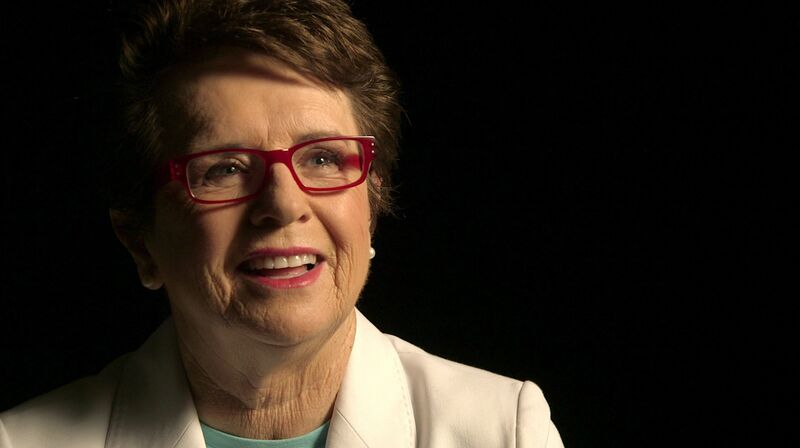 And, as she has already proven decades ago, there's no one who can do that better than Billie Jean King. Lori Sokol, Ph.D., is an organizational psychologist and the founder and publisher of Difference Matters magazine.